At 4.53pm on the 5th July 2010 the life of a brave beard was cut short (literally) against the wishes of its owner, but under doctors orders after a bout of folliculitis. It was 6 months and 11 days old. I know that there will be a national outpouring of grief at this news, but I would ask you not to send flowers or donations. Perhaps find a quiet corner of your office or home to observe a moment’s silence and then attempt to get on with your lives. I will reluctantly (and with huge difficulty) try to do the same. We arrived in Bangkok with a bushy beard in tow, not aware of the horrors to come. Our initial impressions were good, when a 40-minute taxi from the airport cost us four pounds. Our hotel was a pretty decent business hotel, with a comfortable room and a big TV to watch some tennis and football highlights on. However, when we planned our route to the main tourist attractions the following steamy, but overcast, morning, we realised quickly that the city public transport system appears to be only partially built. The Skytrain, which soars above the city’s traffic, is excellent and cheap, but we needed to then get a taxi at the end of the line to get us to where we were going (where the majority of the tourist sites are clustered, so you would think they might have transport links). The Skytrain basically just ends in the middle of the main road into the city, so we suspect that the Bangkok municipal council just ran out of cash. A major coincidence occurred within 5 minutes of us getting out of the taxi. When people say it’s a small world they’re not kidding, we were tapped on the shoulder in a market by the French couple who had been in our group in the Pantanal, back in February! After a quick catch up and a comparison of tans (they win), we had a saunter round the market and our first Thai food with mixed results (Jane a lovely noodle soup with meat and veg; me several cubes of flavoured tofu on a stick). Jane continued her habit of dressing inappropriately for religious buildings (she was once kicked out of the Duomo in Milan for wearing the miniest of miniskirts) by failing to cover herself in the manner befitting a lady and was handed a fetching man’s shirt in pea green to wear (she wasn’t alone in this and consequently the temple looked like it was hosting a female darts competition). Ladies and gentlemen.... best of order please! The Grand Palace was superb – incredibly ornate temples and statues with towering roofs, hand painted walls that looked like wallpaper, a revered emerald Buddha statue which was a little too small to see (and was actually made out of jade) and the classic guards that stood stock still on boxes despite being surrounded by tourists. We passed through the amulet market after the palace, where literally the only things for sale are medallions, stones, pictures and statues and the only non-browsers appeared to be monks with iPods and mobile phones (which we found a little incongruous). We then had a long walk to the famous backpacker haunt of Khao San Road for a look-see and decided that since we’d had to get a taxi part of the way here, we might as well get one all the way back. This was a mistake. Bangkok traffic must be the worst in the world. At one point on the journey we travelled 500 metres in 19 minutes (they have a handy display to help fuming passengers calculate how much further they could have got had they decided to clamber onto the back of a tortoise instead). Luckily, taxis are extremely cheap so our one hour ride cost about 3 quid. We dined that evening in one of the profusion of night markets, plumping for the roast pork/roast duck/beer option, which I think was a winner. The following morning we had a complimentary tour to three more temples provided by our hotel. This was excellent (apart from the heavy rain) until they took us to a gem factory at the end, to watch a short film and to be sold to, though we stonewalled beautifully. To be fair to them, one of the brochures said that the tour ended with a visit to some kind of retail emporium, and there is, after all, no such thing as a free lunch. If you were actually in the market for some gaudy ruby jewellery then it would have been a good stop off. But we were not. Wat Pho, which contains a reclining Buddha 46 metres in length (this is pretty damn long and his head sticks out of the building). 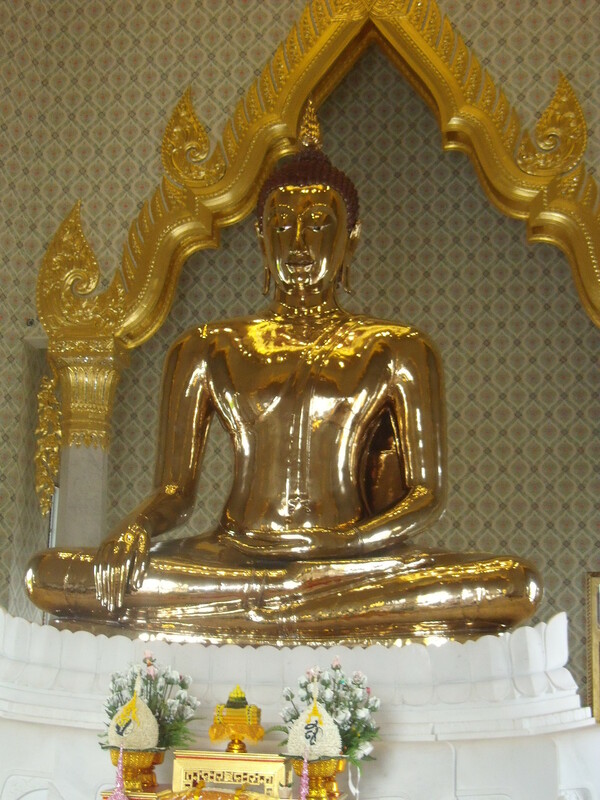 Wat Traimit, containing a 5.5 tonne solid gold Buddha. 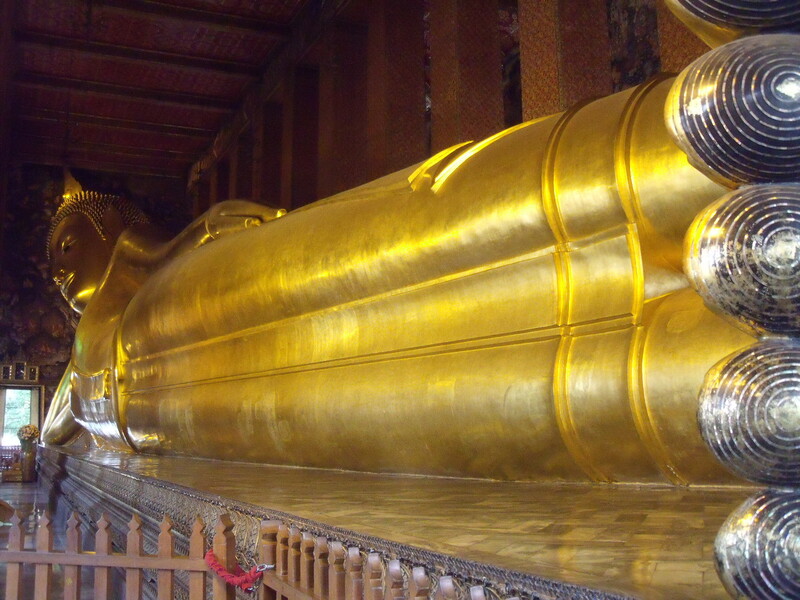 Wat Benchamabophit, a temple built of Italian marble and containing a former king’s ashes. As was the case in South America when we visited the ornate Catholic churches there, we couldn’t help wondering whether all this gold and glitz could be put to better use elsewhere, especially whenever we saw a man missing numerous appendages begging. We spent the remainder of our final day partially lost and beginning to dislike Bangkok’s city planners. We stumbled upon a decent lunch in Chinatown and then embarked upon a walk to a museum which sounded quite interesting. We never made it to the museum and realised that walking is not an option in Bangkok (walking being our preferred way to see most cities, this was a shame). We had a map that wasn’t to scale, which didn’t help, but after walking for a couple of hours in oppressive heat, traffic, smog, dripping drainpipes and broken pavements, we’re not ashamed to say that we gave up and headed back to the air-conditioned haven of our hotel. We visited another night-market for dinner and were squeezed in between a pair of pretty young hookers (sisters allegedly) and their hideous-looking john (English bloke) on one side, and a ladyboy who I’m sure delved into his/her pants for a comb at one stage on the other. 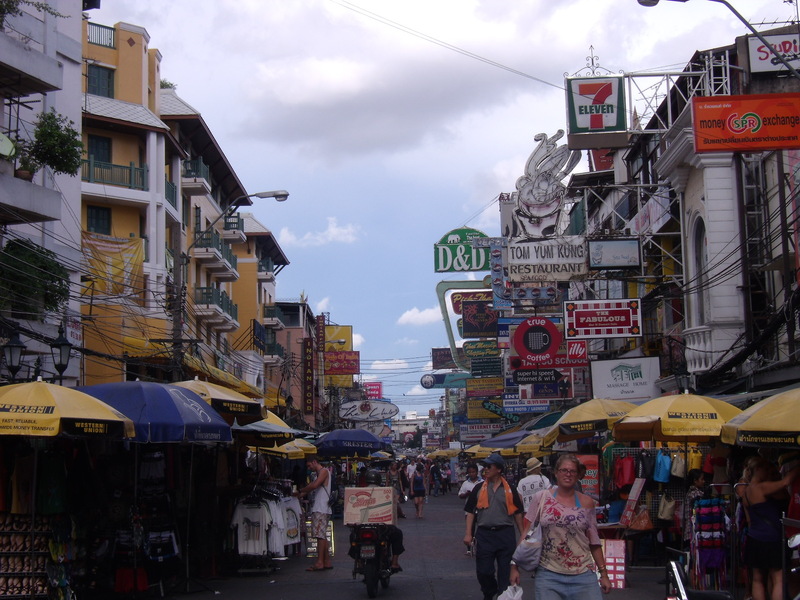 Bangkok’s seedier side is an eye-opener, but didn’t exactly increase my appetite (for food). 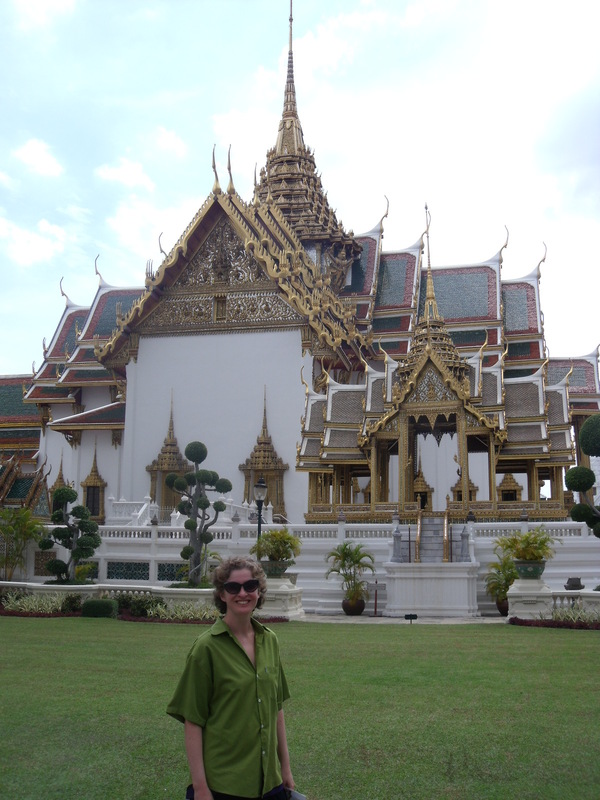 Bangkok’s temples are superb, worth visiting the city for on their own. However, because of the transport system, the lack of any thought for pedestrians and the general pollution and scabbiness, we say that Bangkok is the Buenos Aires of Asia. Come for a day, do the temples, eat some random street food and then leave. We left (not before the hotel were unable to get us a taxi even though there were several taxi drivers with their vehicles not far up the road! 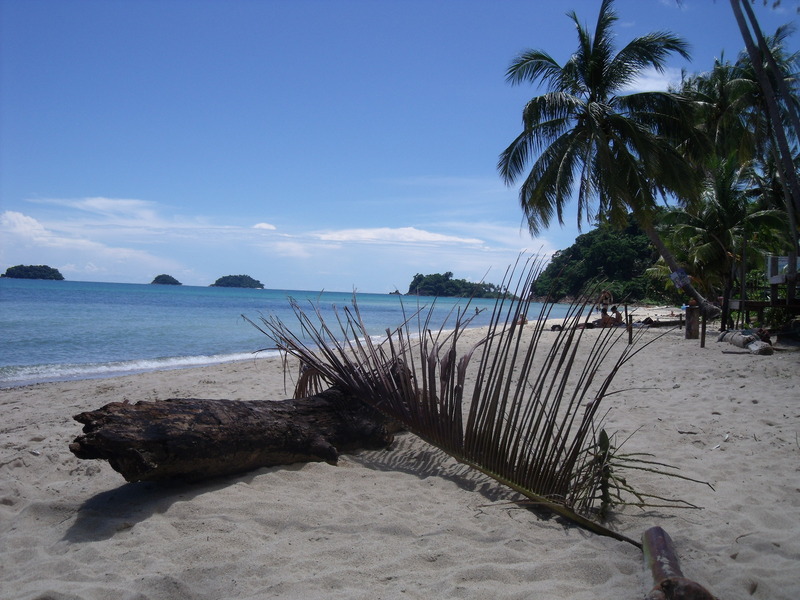 ), for the beaches of the island of Koh Chang. I won’t bore you with a daily report of us going to the beach to paddle in the calm, shallow waters and lap up the glorious 30+ degree sunshine, but suffice to say it was lovely (although it did rain overnight, very heavily, a couple of times and once in the morning). I know we’re going to sound like ungrateful sods again, but travelling non-stop is pretty tiring, so to spend some time in one place with the sun on our backs was marvellous. The little town where we were had a few restaurants (we’re not talking The Ivy but we had some cracking curries, salads, soups and noodles (I may be addicted to pad thai)), a barbers (so I finally managed to tame my lengthening locks), a couple of bars and 316 tattoo parlours. The number of people we’ve seen with (incredibly ugly) tattoos beggars belief. They’ll regret it when they’re older/fatter. The only obvious downside to Koh Chang was the bar near our bungalows, which played music at a ludicrous volume every night. It would wake us up and keep us awake, even though we were at least 100 metres away and had earplugs in. I wouldn’t mind but it is low season and everywhere (including this bar) was pretty much empty! It also didn’t help that the music was either late ’90s dance music last heard in the student bop, or a terrible local band doing Police covers. The beard saw its sad demise on Koh Chang, but not before we took some photos of the sad event (which you can view on Flickr) and I had a half-hour stroking and combing session. “The Project” as one Kiwi chap called it in Santiago, was fun while it lasted and now I have to get used to seeing myself in mirrors and wondering who the heck it is (I also never realised how small my chin is). I look ridiculous. 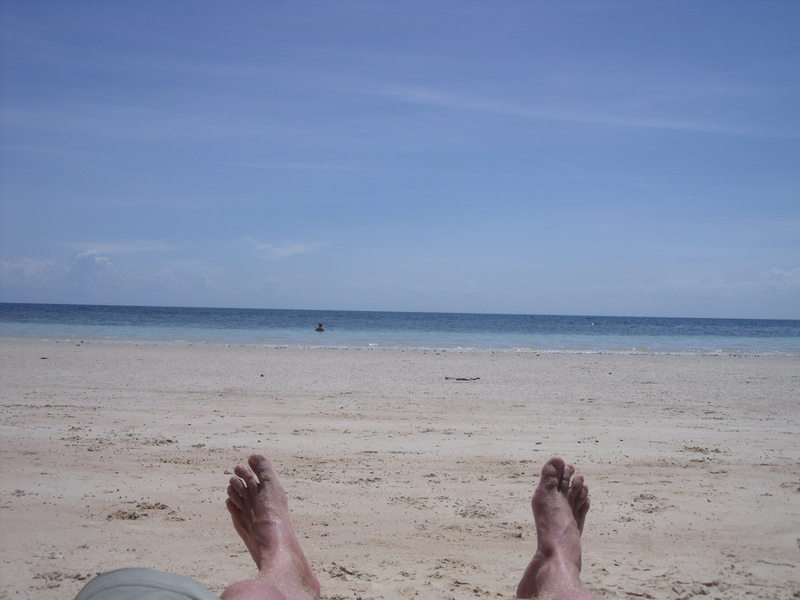 Anyway, we enjoyed the beach at Koh Chang so much that we’re on the beach again, after passing through Bangkok to get a sleepless sleeper train, followed by a catamaran, to Koh Tao, where we’ve had a scuba diving refresher course followed by our first dive today. Unfortunately, the visibility, which has been excellent for the last few weeks apparently, had deteriorated to the point where it was akin to swimming through Mulligatawny. We’ll hopefully do some more diving in better conditions in the coming days. The rest of the time we’ll be lazing on the beach thinking of you all. Whilst the beard length subtitle will be retired, I’m hoping the skin colour subtitle might get more exciting in the next few weeks. « Would you like a raw egg with that? 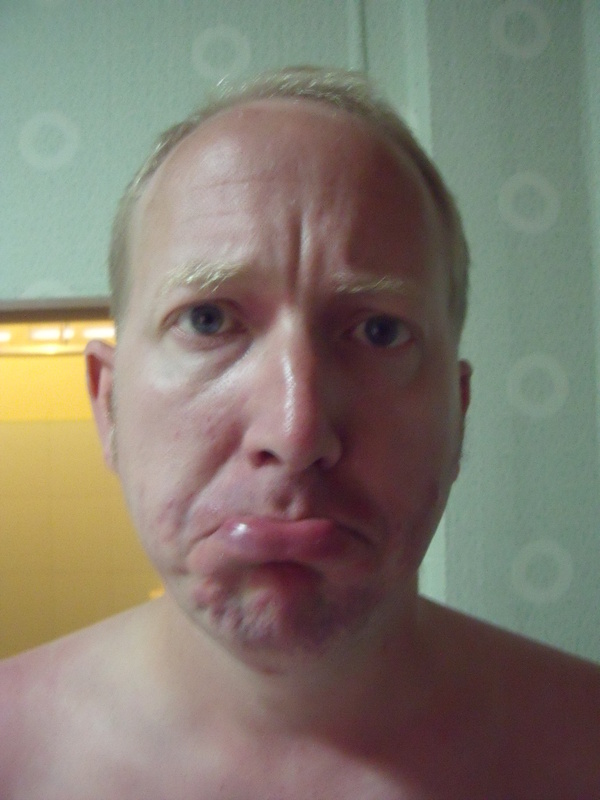 So sorry about the beard, Tom (he said, failing to hide a sneer) – a 2-minute silence has been observed………….many a time. Small chin? Don’t worry – the hooter makes up for it. Your impression of Bangkok gives the lie to those other, all too numerous, visitors who go there for purposes which would never cross your mind! Although you wouldn’t have understood why they were there, did you happen to notice any of your fellow Brits? Yes we did – dirty buggers! As I said earlier, the beard thing was OK while it lasted, but Halleluyah for folliculitis!! It is good to see your face – and chin! once more. Loved the photos! We did the requisite 2 seconds mourning, & now look forward to the skin colour updates. 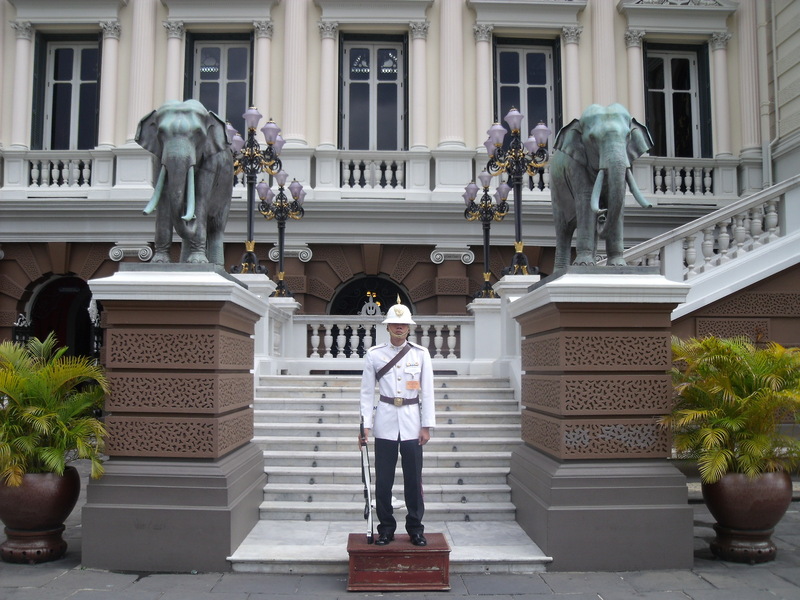 Those Buddhas look amazing, as did the Grand Palace – lovely elephant statues! Good to talk to you both today – enjoy your rest & hope the diving conditions improve.